Ever since I wrote the post about Boca Burgers Exposed, I have been making it a mission to create easy veggie burger recipes. Like these black bean veggie burgers. You can read about the Boca Burger post here. This is a burger recipe we have been making for a long time, so I thought it was about time to get it up on the blog. These burgers provides a nice alternative that even older kids should be able to sink their jaws into. 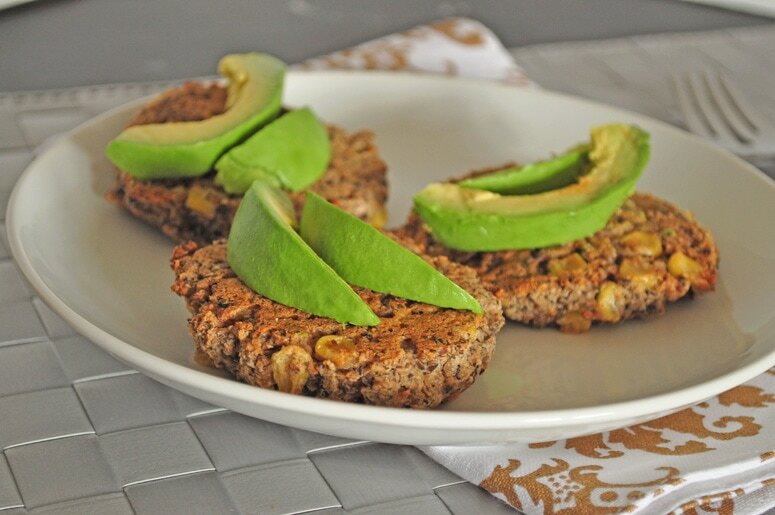 These black bean veggie burgers would be great on whole grain bread, in a sprouted corn tortilla or served over quinoa. The key to making this a tasty dish is the caramelized onions and the crispy outside. This recipe makes a lot so you will be able to freeze some. That is what we do. These would go great with my Healthy French Fries. Dice or food process the onion. Saute the onions in the walnut oil on medium heat until they are caramelized. In a food processor , mix the beans, flax egg and milk until the beans are mostly smooth. Put the bean mixture, the onions and the remaining ingredients in a bowl to combine. To finish, lightly oil a baking pan, grab a quarter cup of the mixture at a time, flatten in a nice round patty, and place on pan. Bake in oven for about 45 – 60 minutes turning over once about half way through. When serving, they go really well with some avocado. Enjoy! Hi Melissa, I'm making these burgers tonight and the mixture seems very wet. I followed the recipe exactly except I used a real egg instead of a flax egg and regular white flour. I can't exactly form them into a patty. It's more like round circles of pancake batter on the baking sheet. Just wondering if I did something wrong and if they will come out all right? They are in the oven now. I haven't made these in so long, but I don't remember the batter being very wet. Can you just add some more flour? Let me know how they turn out. Oh good idea! Never thought to do that. Do we drain the beans or dump the canned beans (liquid and all) into the food processor? Drain and rinse the beans first. I finally made these burgers and I just love them. I cannot use panko nor corn so I used millet flour. They look just like a real burger. Mr Boopie even tried them on a bun and he loved them. Thank you so much.